$63,000 USD Brand New Listing! Address: 480 Maplewood Lane VERY WELL MAINTAINED! Garage: "Room to park two vehicles! " Size: 984 sq. ft. "Plus Screened Lanai "
One owner home! 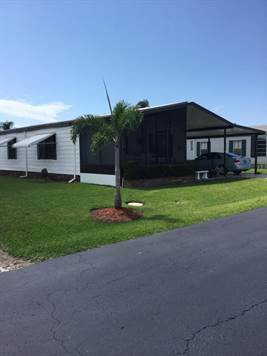 Say no more because all major components of this well furnished two bedroom two bath home are in Tip Top shape like new. ZzzzazqazThe kitchen appliances are newer, the kitchen cabinets and counter tops were updated within the last 10 years. Regular maintenance had been performed on AC system. Storm shutters are on all back windows. The spacious living room in the front of the home provides lots of natural light to shine through. Both bedrooms are large and spacious. The master has en suite bathroom with plenty of room for linens and personal items. The guest room is currently being used as an office/den. . The Long covered carport provides parking for two cars, and has a nice area for outside patio furniture and grill. The Utility room/shed is just outside the kitchen door, and has plenty of room for storage and projects. Beautiful landscaping and flower beds make a peaceful enjoyable place to relax.